Cells can be autologous (patient’s own cells), allogeneic (from a genetically similar but not identical donor) or xenogeneic (the donor cells are derived from a different species than the recipient). Autologous cells present a great advantage: being the patient’s own cells, rejection by the immune system and the consequent undesirable side effects are avoided. On the other hand, cells can be specialized adult cells (such as dendritic cells) or stem cells (capable of differentiating into different cellullar types). Regardless of their origin or typology, the objective of cell therapy is to regenerate cells or cellular functions damaged by the disease by injecting cellular material, previously treated in the lab, into the patient. It is a promising therapeutic strategy in order to improve neuroprotective mechanisms and induce neuroregeneration in multiple sclerosis. Our body is made up of different tissues and millions of cells that come from a single one, the zygote, which will develop into an embryo. As the embryo continues to develop, it will subsequently become a new individual. The zygote has the capacity or “power” to generate any cell type; it is, therefore, “totipotent”. Otherwise, most cells that form an adult organism have lost this “totipotent” capacity, since they have specialized in a specific cell type (neuron, skin cell, lymphocyte, etc.). They have become specialized adult cells. One type of specialized adult cells of interest in cellular therapy for MS are the dendritic cells or “antigen presenting cells”. They are part of the immune system and control its activity. How do they do that? Dendritic cells (DC) have the ability to capture antigens (proteins recognized as foreign by the immune system) and present them to T or B lymphocytes, thus regulating their immune response. On the other hand, immature DCs have another optimal characteristic: “functional plasticity”. Depending on the environment in which they mature, DCs can create immunity (prompt the immune system to attack) or tolerance (regulate the response of the immune system to prevent it from attacking). They would, therefore, become immunogenic DCs or regulatory DCs respectively, as shown in the following image. 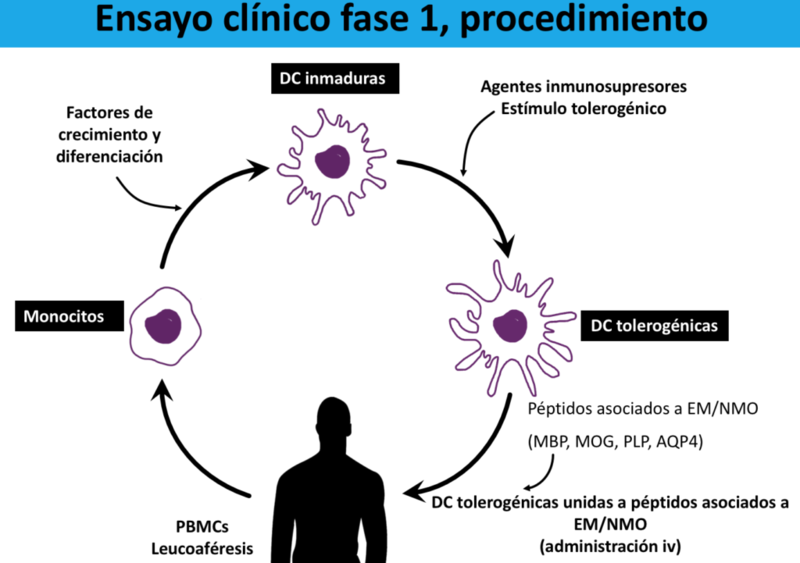 The project “Antigen-specific immune tolerance therapy with dendritic cells”, currently being carried out at the IDIBAPS / Hospital Clínic of Barcelona, ​​bases its research on the maturation of immature DC (obtained from the differentiation of monocytes extracted from the patient’s blood) in a tolerogenic environment in the lab in order to obtain tolerogenic or regulatory DC. Next, the cells are treated with myelin proteins and administered intravenously to the patient to “reeducate” or induce tolerance towards myelin to the rest of the immune system. This tolerization process is key for the immune system to fail to recognize myelin as foreign and to attack it. The objective of this therapy is to modulate the patient’s defenses in a specific and selective way, to prevent or stop the inflammation caused by antigen-specific T-lymphocytes without altering the rest of the defenses, so that adverse side effects are diminished. Another example of a study that uses dendritic cells as cellular therapy is the one carried out in Hospitals Germans Trias I Pujol which, unlike the previous one, treats DCs with vitamin D3. We subscribe the principles of HONcode.